The U.S. videogame industry stayed effectively flat for November, as reduced hardware sales were offset by strong software sales and a huge leap in boxed PC games. It's not looking like the best holiday season ever for the videogame industry but it shouldn't be a complete train wreck either, according to the NPD, which released numbers today indicating a year-over-year decline of 0.5 percent in the U.S. videogame market for November. Hardware sales are down nine percent, sliding from $1.08 billion last year to $982.4 million this year, while peripheral sales crashed a whopping 34 percent, a decline "probably largely explained" by the launch of Kinect last year. On the upside, software sales for both the Xbox 360 and PlayStation 3 were strong for the month, with Modern Warfare 3 leading a pack that included Battlefield 3, Assassin's Creed: Revelations, Just Dance 3 and Skyrim. 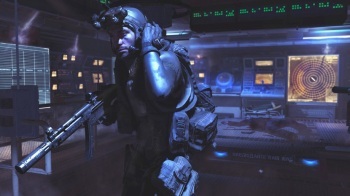 Modern Warfare 3 sold 8.99 million units across all formats in November, dwarfing the numbers of the second-place Skyrim, which put out 2.8 million units. Rather strangely, PC boxed retail sales saw a huge increase, jumping an amazing 57 percent year-over-year. Sales details weren't released but the launch of the PC-centric [relatively speaking] Battlefield 3 and Skyrim in fairly close proximity to one another seems the most likely explanation. On the other side of the coin, Wii game sales continued to slide, dropping another 28 percent, but the discounted 3DS managed to keep handheld sales almost flat, holding the line at just a one percent decline. Cowen and Co. predicted that December wouldn't be much better for the industry, calling for a "mid-single digit" year-over-year shrinkage due to shrinking Wii and handheld sales, which in past years have driven sales for the month. "[This is] due in part to a tough comp versus the launch of Epic Mickey last year, and in part because December sales tend to weigh more heavily towards the Wii/handheld platforms, where overall sales trends are worse," the firm wrote. "However, we believe that sales on the Xbox 360/PS3 platforms will once again be up double digits."